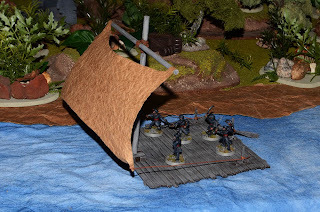 I built a raft for the slavers for my next Forgotten Islands Hyborian Adventure game. 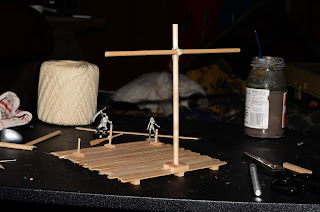 I made the whole thing from wooden dowels and craft sticks. The sail is made from brown grocery bag crumpled and soaked with water that I then dried using a hot iron. I tried to make the raft big enough to have a small combat aboard but no so large as to look unrealistic. The ropes holding the sail are paper covered floral wire I painted brown. Not an overly fancy project but I like the way it turned out.